Microsoft is building its own messaging service to rival Slack, according to the tech grapevine. This won't come as any great surprise to people who follow developments at the company closely, because earlier this year, Microsoft considered making a massive bid to take over Slack. However, apparently CEO Nadella wasn't convinced by the move – hardly surprising given some of the stings Microsoft has received from major acquisitions in recent times, such as Nokia – and Bill Gates also advised against purchasing Slack, instead wishing to develop Microsoft's own products. Hence we now have Skype Teams in the pipeline, according to an inside source who spoke to MS Poweruser, and this new messaging offering will carry quite a number of similar features to Slack. 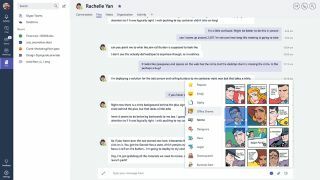 So it'll be designed around chat channels and offer direct messaging – all the usual stuff you'd expect – although apparently Skype Teams will diverge in some elements such as the inclusion of threaded conversations (replies to specific messages which then become threads, Facebook-style). The app will unsurprisingly allow for sharing files such as images and documents, and naturally will maintain Skype features such as facilitating video calls within channels or directly between members. You'll also be able to do things like schedule online meetings. It won't be all work, work, work, of course, as there is a 'fun picker' feature which will allow users to quickly insert entertaining bits and pieces into chats such as emojis, memes and Giphy antics. All of this will be integrated with Microsoft's online productivity suite, Office 365, and the company will probably bring bots in on the action too – because AI and bots are a huge concern for Microsoft looking down the line, as we discussed back in the spring. You can expect Skype Teams to be a cross-platform affair with a Windows version (obviously) along with mobile apps for iOS, Android and Windows Mobile, plus a web app. There's no indication of a possible launch timeframe yet and the service is still in testing, but it will likely come to Office 365 users before anyone else gets a look in. See also: Should you buy a Surface Book?